I recently had the pleasure of chairing the Energy Council’s 2013 State and Provincial Trends in Energy and the Environment Conference which took place June 20th – 23rd in Bismarck, North Dakota. This was the first time the Council met in North Dakota and it was a great opportunity to see first-hand the oil and gas production activity in the Bakken shale play. On the opening day of the conference, North Dakota Governor Jack Dalrymple gave the keynote address followed by a trip to the North Dakota State Capitol for a busy day of presentations and meetings. Alaska Senator Bert Stedman presides over the Energy Council’s 2013 State and Provincial Trends in Energy and the Environment Conference General Session on Friday, June 21, which was held in the House of Representatives Chamber in the North Dakota State Capitol. Senator Stedman introduced the Alberta Minister of Energy, the Honourable Ken Hughes (far left) and Mr. Alex Pourbaix, President of TransCanada Energy and Oil Pipelines (far right), both of whom addressed the conferees. 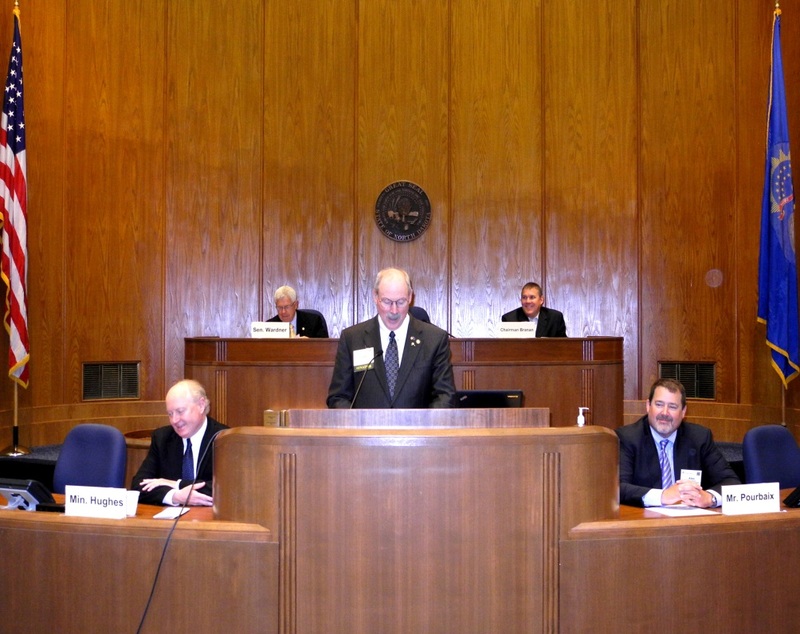 Seated behind Senator Stedman are North Dakota Senator Rich Wardner, Energy Council Vice President for State and Provincial Trends (left) and Oklahoma Senator Cliff Branan, Chairman of the Center for Legislative Energy and Environmental Research (right). During the conference, the Council heard from the Honourable Ken Hughes, Alberta’s Minister of Energy regarding the challenges of transporting Alberta’s oil sands to market. Following Minister Hughes was Mr. Alex Pourbaix, President of TransCanada Energy and Oil Pipelines. He gave a presentation on cross border energy infrastructure and how his company is positioning itself to help move Canada’s oil to market. Other notable presentations included enhanced oil recovery using carbon dioxide, federal regulatory proposals regarding fracking, state oversight of oil and gas well integrity, oil development in the Bakken, shipping oil by rail, and workforce development needs in the energy industry. In addition to the many informative presentations, the Council had the opportunity to tour Occidental Petroleum’s largest Bakken wellsite, the Bakken Oil Express Rail Hub, the Great Plains Synfuel Plant and the Freedom Mine. The Occidental Petroleum wellsite gave me a unique perspective into the organized chaos in the Bakken field. The application of new fracking technology has opened the Bakken shale oil play for an impressive amount of development activity. It is estimated that the available resource should allow this activity to expand for at least 10-20 more years after which production should plateau and begin to decline while the oil companies settle into harvest mode for upwards of 100 years. The Bakken Oil Express Rail Hub located in Dickinson is the largest of eight tanker rail hubs in North Dakota. Each day, two trains depart from this hub with 110 tankers on each train shipping over 100,000 barrels of oil per day to coastal markets. 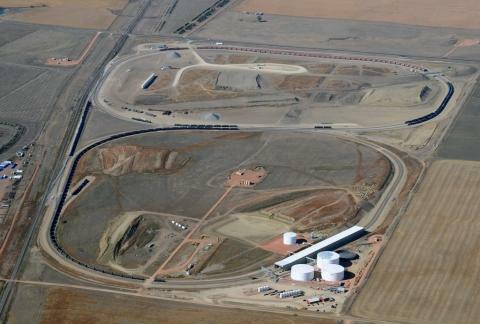 The 350 acre site of the Bakken Oil Express Rail Hub in Dickinson, North Dakota. The Great Plains Synfuel Plant has been in operation for nearly 30 years and is the only commercial-scale coal gasification plant in the United States as well as the cleanest energy plant operating in North Dakota. The plant produces synthetic natural gas from lignite coal supplied by the nearby Freedom Mine. Also of particular interest to me as a policy maker were meetings I had with local community leaders like Mayor Dennis Johnson of Dickinson and others about the challenges they have dealing with the impacts of oil development. The increased activity has been great for jobs and the economy, but it has exceeded the major infrastructure capacity of most towns in the Bakken. Local leaders are currently struggling to secure funding necessary to expand water, sewer and road infrastructure as well as housing, schools, and other public services. Senator Stedman, Chairman of The Energy Council, thanks officials from Dickinson, North Dakota, who briefed members of the Council’s Executive Committee on impacts to their city and region from Bakken oil development. 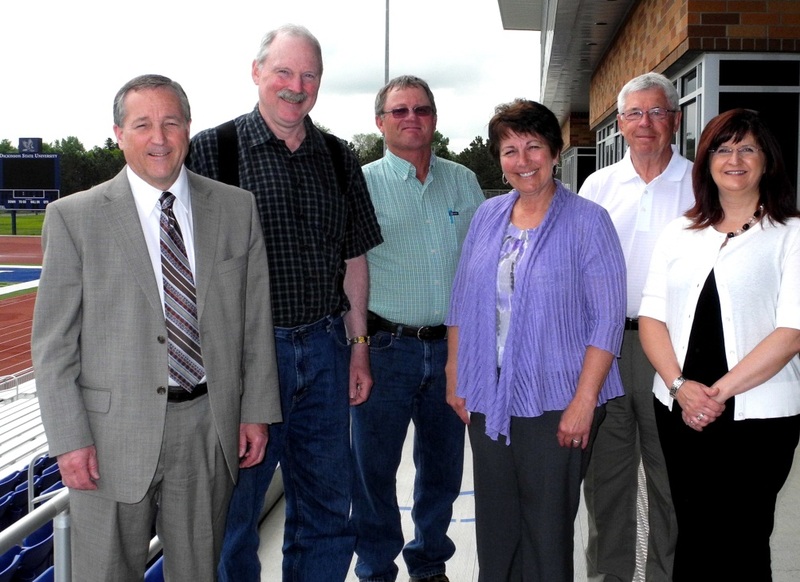 From left to right are Dickinson Mayor Dennis Johnson; Senator Stedman; Mr. Al Heiser, Stark County Road Superintendent; North Dakota Representative Vicky Steiner; North Dakota Senator Rich Wardner; and Ms. Melanie Kathrein of the Dickinson Public School District. As always, the Energy Council’s Executive Director, Ms. Lori Cameron did a wonderful job of organizing the conference and keeping us all on task. Finally, I want to extend my sincere appreciation to North Dakota State Senator Rich Wardner for being a consummate host. Senator Wardner is the Energy Council’s Vice President for State and Provincial Trends and made all the Council members who visited his state feel welcome. The US Forest Service (USFS) is currently conducting a 5-year review of the 2008 Tongass National Forest Land & Resource Management Plan. A public comment period on the plan began in January and concluded on June 30th. This was a good opportunity for the local residents of Southeast to have their voices heard by the USFS as they review potential changes to the Tongass Land Management Plan. I was pleased to submit my comments on behalf of the communities in the Tongass which I represent. A copy of my letter to the USFS can be found here. I want to thank all the individuals and organizations that submitted comments. After a prolonged and tumultuous process, the Alaska Redistricting Board finally approved new legislative districts on July 14th. The current legislative map under which the 2012 elections were held had been thrown out by the Alaska Supreme Court on the grounds that they were in violation of the Alaska Constitution. The Board was ordered to redraw the districts which resulted in the new plan adopted Sunday. According the Board’s attorney, the adopted plan will be submitted to the Alaska Supreme Court for its approval no later than Thursday, July 18th. If the new plan is approved by the Court and barring any successful legal challenges, the new districts will be in effect for the 2014 election. Currently, I represent Senate District Q which encompasses 27 communities throughout the vast majority of Southeast. Under the adopted plan, Senate District Q will become Senate District R and will include the communities of Petersburg, Kupreanof, and Tenakee Springs. Haines and Klukwan will no longer be in my Senate district and instead will be paired with Skagway, Juneau and Gustavus in the new Senate District Q (currently Senate District P represented by Senator Egan). I had the pleasure of representing Petersburg and Kupreanof in the State Senate from 2003 until the 2012 election. My family has always had close ties to Petersburg and Kupreanof and I welcome these communities back. I also look forward to getting to know the residents of Tenakee Springs. For the remainder of the 28th Legislature which includes the upcoming legislative session that convenes in January of 2014, I will continue to represent the residents of the existing Senate District Q including Haines and Klukwan. I will officially represent the new Senate District R when the 29th Legislature begins in January of 2015. I am not up for reelection in 2014 since I was elected to a four year term in 2012 and the population difference between Senate Districts Q and R is only 9.3%. There must be at least a 25% difference in constituency between the two districts in order to require a Senate term to be truncated. Because of truncation, in 2014 an election will be held in 14 of the 20 new Senate districts. The Federal Highway Administration (FHWA) in partnership with the Alaska Department of Transportation and Public Facilities (DOT&PF) has released the Gravina Access Project Draft Supplemental Environmental Impact Statement (Draft SEIS) for review and comment. A 45-day public comment period follows the release of the Draft SEIS. Comments must be received by Tuesday, August 13, 2013. The Draft SEIS examines the social, economic, and environmental impacts of proposed alternatives to improve public access between Revillagigedo Island and Gravina Island. It also examines a No Action Alternative. DOT&PF is hosting an open house and public hearing on the Gravina Access Project this Wednesday, July 17th at the Ted Ferry Civic Center. The open house is scheduled from 11:00 am to 5:00 pm followed by the public hearing from 5:00 pm to 8:00 pm. 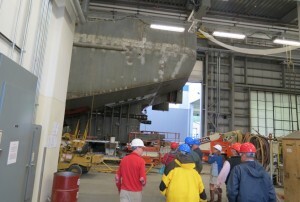 Recently the Pacific Northwest Economic Region (PNWER) organized a Cross Border Security and Economic Development Tour, which included two days in Ketchikan last weekend. State and provincial lawmakers from Alaska, Washington and Canada, as well as congressional staff and port officials gathered to discuss important opportunities and challenges facing the region. My staff was honored to participate in the UCORE hosted lunch at Ketchikan Indian Community Training Center, where the KIC Culinary Arts chef prepared a 5-course meal featuring seafood from Southeast. UCORE’s presentation was primarily focus on their 100% owned Bokan-Dotson Ridge property on Prince of Wales Island and the advantages of getting the mine up and running. The group also toured Alaska Ship & Drydock where Shipyard Development Director, Doug Ward, gave a presentation about the history of the Ketchikan Shipyard, followed by a walking tour of the new indoor assembly hall and production center. The Ketchikan Chamber of Commerce hosted a welcoming reception Saturday evening at The Landing.